When I get a big laugh, I call that a Power Laugh. Why? Because power is the ability to do more and big laughs give you the ability to do more with your audience. Getting hearty laughs allows you to create a memorable experience, slip in a profound message, and have a blast all at the same time. I believe you can get at least a dozen laughs every 3-4 minutes if you understand and practice various humor tools. For example, listen to this 3 1/2 minute opening of one of my recent speeches and then look below for a few of the tools I used. You’re most likely familiar with a Callback and that’s what I did with the line about “Those 25 people I beat…” It was a callback to something my introducer misread in my introduction. Therefore, I called back to a previous speaker. However, there are many other types of callbacks you can make including calling back to what I call PEST. I can call back to my Preparation, something that happened at the Event, something said by another Speaker, and even something that happened during my Travel to the event. 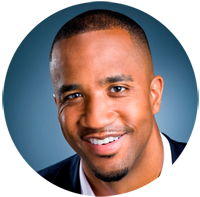 The key is to know how and when to call back and how to seamlessly bridge the gap between multiple callbacks. When I gave the quick example of George Washington Carver, that was me using what I like to call Historical Humor. Some of the best humor can come from funny situations that happened to historical figures. Although this is not a tool I use often, I have even uncovered humor by telling a story about Harriet Tubman. The key is to make sure you can then tie that example into what you’re currently going through these days. Of course the old-fashioned “twist” is another way to uncover humor. It’s when you take your audience down one road and then unexpectedly change directions. I did this with my daughter’s letter. However, one reason the twist works is because I “sell” that we’re going down one road before I change directions. For example, when I read the note, I say, “Dear Daddy, I miss you.” After that I pause and let my audience feel my pain. That helps give them momentum down one road before I read that, “You’re the best daddy in my whole family.” The other key here is the twist should be visual and verbal. In this case, not only do the words change but so does my expression. With other twists I have, I actually walk in a direction on stage and then, at the twist line, I stop and look the other way (or look out at the audience). 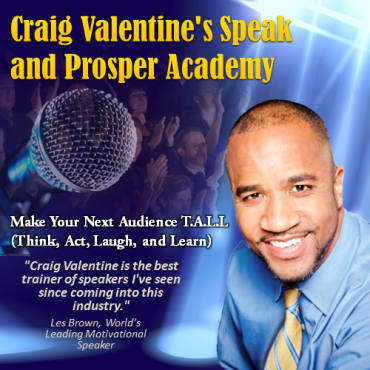 The visual with the verbal twist goes a long way and draws a major laugh. A key to Tag-on lines is knowing where they should come from and how to develop them. It’s darn near scientific and surefire when you know where to look for them. They’re so important because they can help you turn one laugh into 3, 4, or more. All of a sudden, instead of 15 laughs in your speech, you can have more than 45 just with this one tool. In my upcoming Humor Speaking Secrets Course, you’ll see how to develop them and where they should come from each time so that they can’t miss. One of the most prolific tools you can use for humor is Character to Character Dialogue. I got a nice power laugh when my son looked up and said, “How old is the horse? !” To get laughs from character to character dialogue, it’s critical to actually briefly possess the persona of the person who said the line. For an instant, I have to become my son in expression, tone, posture, and even in the eyes. I’ve seen many speakers give funny lines but all the lines seem like they’re coming from the same person (themselves). Most of the funny lines should come from the other characters anyway. I personally like to take advantage of 5 different kinds of spontaneous moments. However, with whatever kind you use, you can’t be afraid to use it. You must be willing to leave your mental script to jump on the magical moment. Of course, sometimes you can seed the spontaneity too but that’s going beyond the scope of this post. In the audio you just heard, I was about to go into my Big Promise when I stepped on a part of the stage that felt like it was about to give way. Because I almost buckled, I decided to jump on the moment and that’s when instead of saying, “How do you get remarkable results in business AND in life?” I said, “How do you get from one side of the stage to the other?” Of course my look had to ride the line for it to be even more funny. I cherish those spontaneous moments, because they automatically make the speech fresh. That’s the opposite of canned. Hopefully you’ve found these ideas above valuable. Well, there’s a lot more where those came from. We haven’t even come close to scratching the surface. 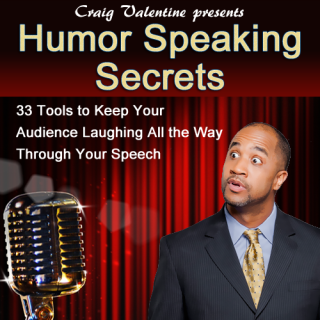 What I love about the 33 tools you can pick up in my Humor Speaking Secrets Course (that’s coming soon) is that you can use them over and over again in every speech you give for the rest of your speaking life. As you can probably tell, I’m very excited about the release of this course. Why? It’s because not only can it change your life as a speaker, it can help brighten the lives of all your future audiences.